We have a form where the user requests a part. For each part they need to include Part #, Manufacturer, Qty, Price. Using the "shrink", I have been able to setup at least a default 3 rows (had to include a hidden field between each row in order for it to display properly though). What we want is for the user to be able to add any number of rows by clicking some kind of "add another row" link and it will then show another row of fields. There’s no dynamic way to incorporate this in JotForm. 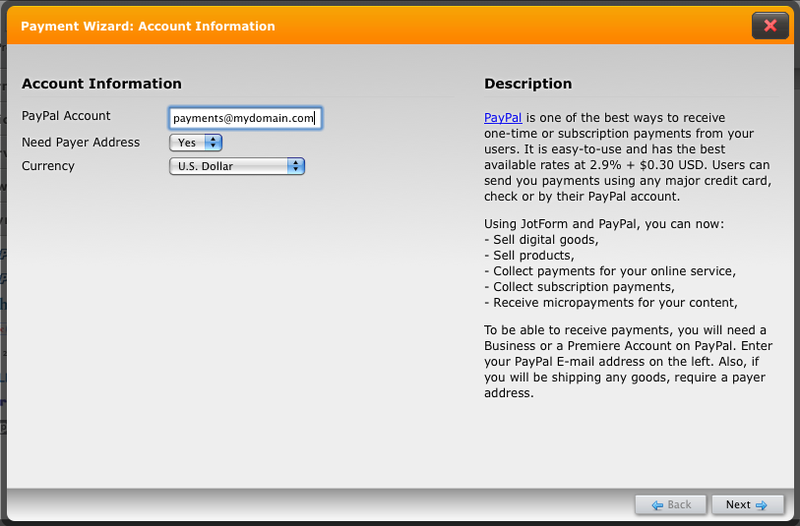 But one thing you could look into is by adding paypal or other payment gateways integrated in JotForm. This will allow you to list your products and set their prices. I’ve attached a guide for you to follow. For you create a new PayPal form, open the “Payment Tools” toolbox on the left side and drag “PayPal” icon into your form. You will see two options on the Payment Tools. “PayPal” option allows you to create PayPal forms for PayPal Standard. If you have a “Payment Payment Pro”, you can use the second option to get users to enter credit card details right on your page. When you add the PayPal field to your form Payment Wizard will launch automatically. You will be asked to enter your PayPal account information. Need Payer Address: If you will be shipping a product to the user or need address for some other purpose, select Yes. Currency: Select the currency in which your products will be priced in. 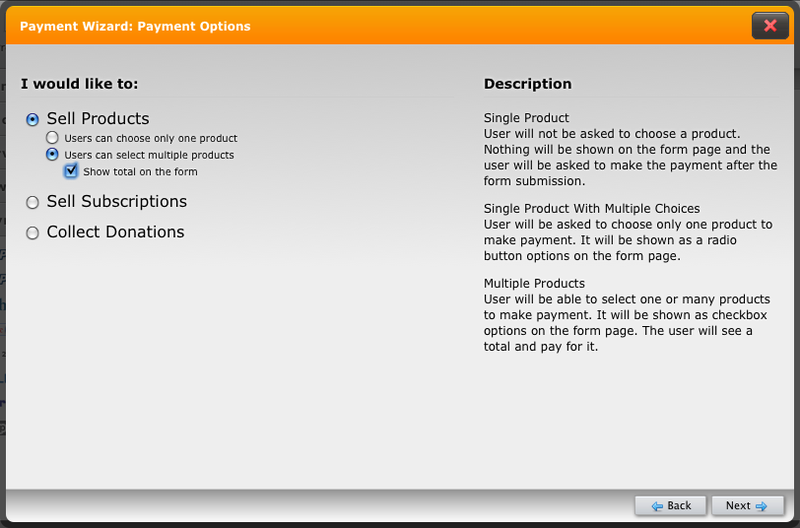 To understand what types of payment forms you can create with JotForm, see Payment Form Types page. A product can be anything that requires one time payment . Example products might be shipped goods, digital goods, event registrations. A subscription on the other hand will get users to pay you a recurring payments . Once signed-up user’s PayPal account will send you payment periodically. You can get these payments weekly, monthly or yearly. A donation is also a one time payment just like a product, but users can set their own price . Enter your product prices and options. Each product must have a name and price. You can also have an image for your product. Click on “Add New Options to add additional choices for users to select. For example, if you are selling a t-shirt, you can ask users to select quantity, t-shirt size and color. Once you complete all steps on the payment wizard, you will see a final confirmation page. You can edit label of your question by clicking on “My Products” or click on the toolbar buttons to configure your question. You can also click on the wizard icon on your question to re-launch your wizard and update your product details. It takes only couple of minutes to create a PayPal Form with JotForm. It is also highly flexible. 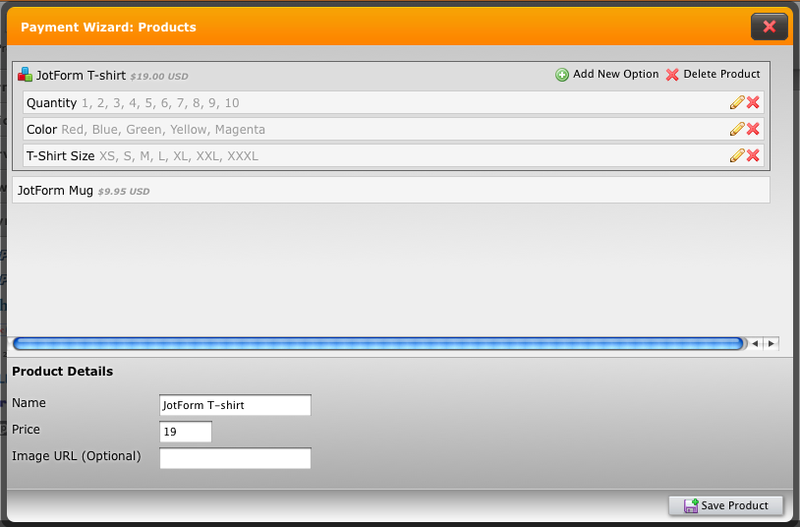 You can create multiple product forms with many options to choose. If you have any questions about Paypal forms please feel free to contact JotForm support and we would be happy to help you. We are not selling anything on the site, so that doesn't help unfortunately - thanks though. As I've mentioned, there's no current way to dynamically add items on your forms. But, I do see how this could be helpful. I've already submitted this feature to our request list. Hopefully, our developers will be able to integrate this in the near future.